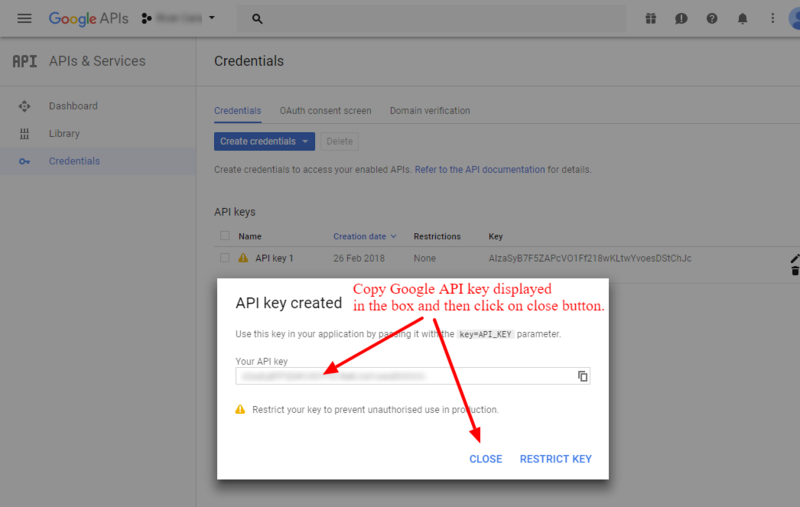 Learn how to setup Google APIs in your google account and how to connect it to the system. Why do I need to connect Google APIs ? This services are use to: calculate distance between locations, geocode locations, get address suggestions and display a map, thus allowing to calculate the journey price and display journey information during a Web Booking process. 1. Register or use your existing Google developer account. 3. Enable Services: Navigate to APIs & Services -> Library and using search option, one by one find and enable services listed below. In most cases you will use same API key for all services, in some instances you may use a different one for each service. 5. Setup Billing Important! You also must enable billing profile for your project in Billing -> Overview tab otherwise Google will apply daily limits and the API you have created won’t work. Please see the last screenshot below for more details. Note: You can read more about limits and charges here. The API key restriction is important to prevent unauthorised use and quota theft. 1. In API name field enter “Browser key”. 2. From “Key restrictions -> Application restrictions” (displayed below name field) section select option “HTTP referrers (websites)”. 3. In the section “Accept requests from these HTTP referrers (websites)” enter the URL (http:// and https://) where the booking software is installed e.g. “http://example.com/*” and “https://example.com/*”. Each URL should be entered in new row. Please note that you must replace “example.com” with the correct domain or sub-domain name to make it working (you can get this name from the URL that you use to login to booking admin panel). In booking software version 3.10.2 or higher you can find this information in Admin -> Settings -> Google tab, just hover over or click on the text “Google API Key restrictions configuration” or info sign icon to see correct settings. This text/icon is located above Google API fields. 1. In API name field enter “Server key”. 2. From “Key restrictions -> Application restrictions” (displayed below name field) section select option “IP addresses (web servers, cron jobs, etc.)”. 3. In the section “Accept requests from these server IP addresses” enter the Server IP where the booking software is installed e.g. “127.0.0.1”. Please note that you must replace “127.0.0.1” with the correct Server IP name to make it working. You can check your domain or sub-domain IP address here, just enter its name in the box and click “Lookup” button. Note: In case you have any problems please disable API key restriction to see if the system will work without it. If it does then it means the restriction hasn’t been set correctly. Note: This service is provided by a third party company. We don’t take any responsibility for any changes in how this service operates or works. Any issue with this service you need to discuss directly to company which provide it.